I almost felt like we should have taken this picture in the new downstairs bedroom area instead of the kitchen since that's where we've been working for the past two weeks. Hopefully the next pic will have a more cleaned up/finished kitchen pic to go with it. Also, please excuse my extremely tired looking face... normally I'm better at hiding it. Total weight gain/loss: 12 lbs... doing pretty well with gaining the necessary 1 lb a week. Sleep: I'm getting used to getting up in the middle of the night and while I get sleepy in the afternoon, I recently have been feeling like I'm sleeping a lot even though I'm not... like I'm always surprised when I get up at night and it's only 3:30 or 4 and I often feel like I sleep in in the morning but I usually get up between 7:30 and 8:30. Best moment: We've had a good couple of weeks baby related. We are almost to the point where we and the baby can live downstairs again and we had another ultrasound which we always love. Movement: There's a lot of rolling and pushing going on in there. 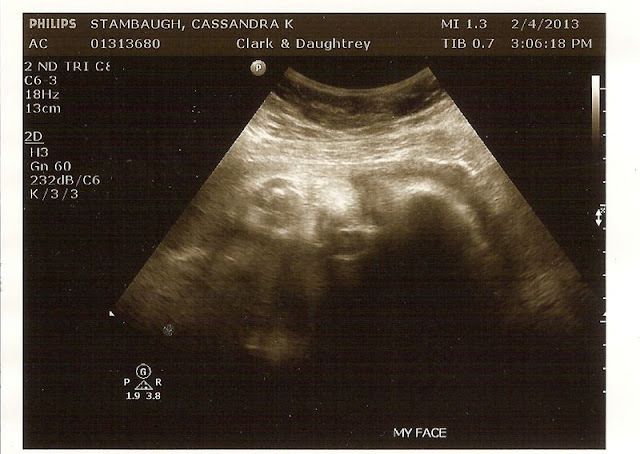 The baby also has been getting the hiccups A LOT including while we had our ultrasound which was a lot of fun to see. 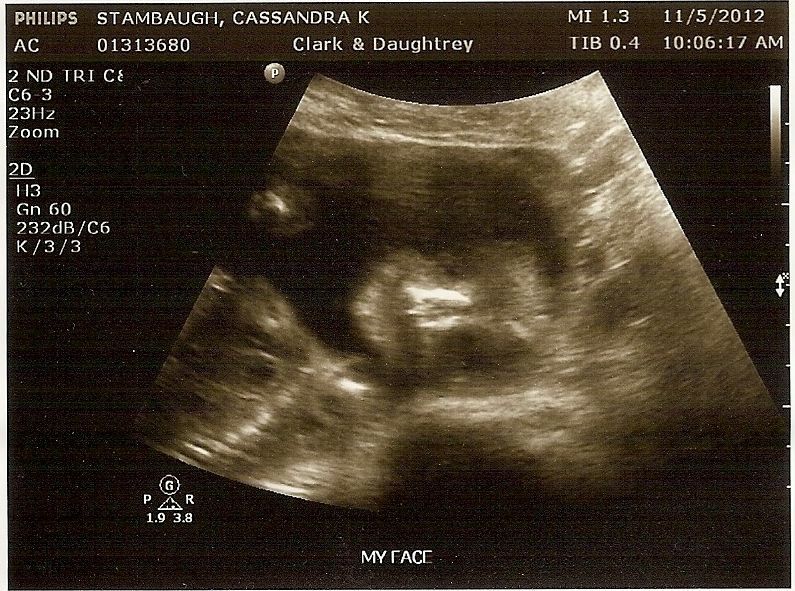 During the ultrasound we also confirmed that it is indeed the baby's foot trying to kick my ribs out of the way. Food cravings: No food cravings but I've been drinking water like it's my job. I've been fighting a sinus infection so between that and the pregnancy, no matter how much water I drink, I still feel dehydrated. Symptoms: My hips are the worst they've been, especially if I don't change positions a lot. This means when I get up in the middle of the night I can barely walk. Also, as I mentioned above, I'm fighting a sinus infection and while I get these fairly often, the pregnancy has caused my body to do some funny things as a result like one of my neck glands swelling to a crazy size. Even when I had mono I never had glands that size or as sore. Luckily, it is finally decreasing but this past week has been less than stellar health wise. Gender: Boy! with confirmation from this past ultrasound. Feeling toward Pregnancy: Both Nate and I are getting a little antsy. We still have a lot that we want to do but the light at the end of the tunnel is getting brighter and we are both super ready to meet our baby. 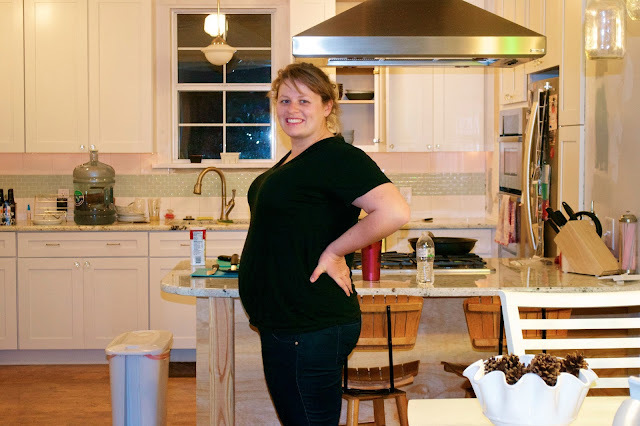 What I am looking forward to: Finishing the nursery and moving back downstairs. Milestones: We completed our birthing class and toured the hospital. We also have a list put together for things to bring to the hospital so I just need to put it all in a bag! It's crazy to think that we are only 3 weeks away from being considered full term and 6 weeks away from our due date! Here is a face on view of the baby at 22 and 33 weeks. We can't believe how chubby the little guy has gotten!